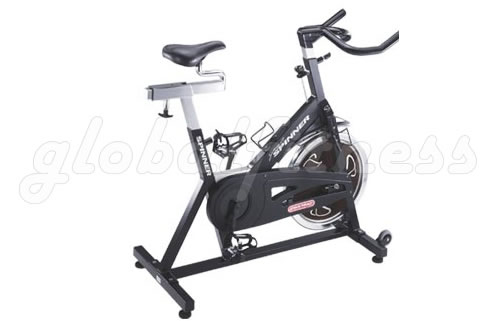 On the Star Trac Spinner® Pro indoor bicycle, you are in control. Since 1974, Star Trac has been filling health clubs with bikes like the Spinner® Pro that require little maintenance, stand up under constant use, and meet the most exacting user requirements. And stand-up you will, with the aid of the Spinner® Pro's No-slip Grip Handlebars, optional dual-sided pedals with larger platform and SPD™ compatibility, and precise "Pop Pin" adjustments on the seat and handlebar posts that deliver a great fit for all sizes. As you climb hills and dash down straight-aways, you will stay safe with the Spinner® Pro's "Push-Brake" safety system that brings the flywheel to a fast stop with minimal effort. The Bottom Bracket crank cover provides complete protection from rust and corrosion, and your hydration requirements during an intense workout will be met by dual water-bottle holders for ultimate functionality and convenience.